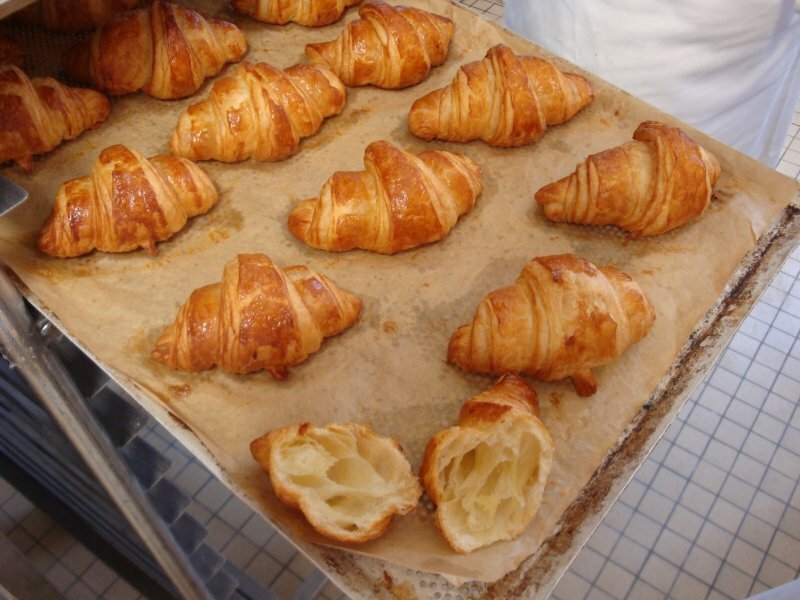 Le 15 Patisserie: For the Love of Food; Henry's 20,000 Euro Croissant Quest! For the Love of Food; Henry's 20,000 Euro Croissant Quest! Love makes us do strange things. From jumping off cliffs to spending more than 20,000 euros on learning how to make the perfect French Croissant! 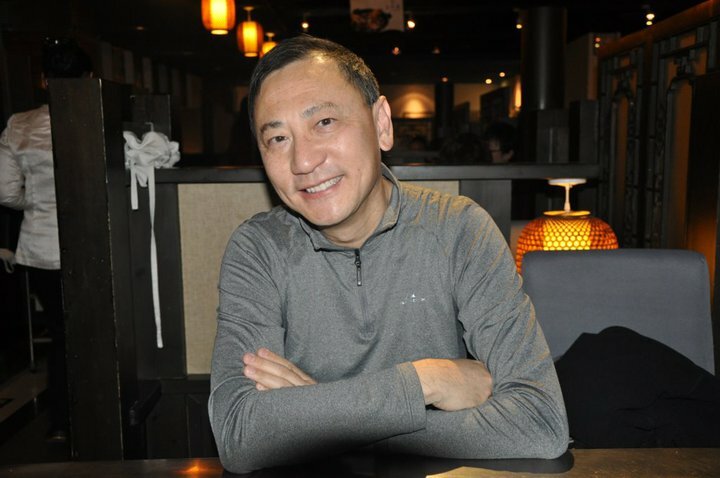 I met Henry Ting in my first week at culinary school and we instantly bonded over our love for everything sweet. So what made a highly successful software engineer leave his life in America and move to Paris? This being Valentine's Day, I thought it would be a great idea for my dear friend Henry to share his love story. 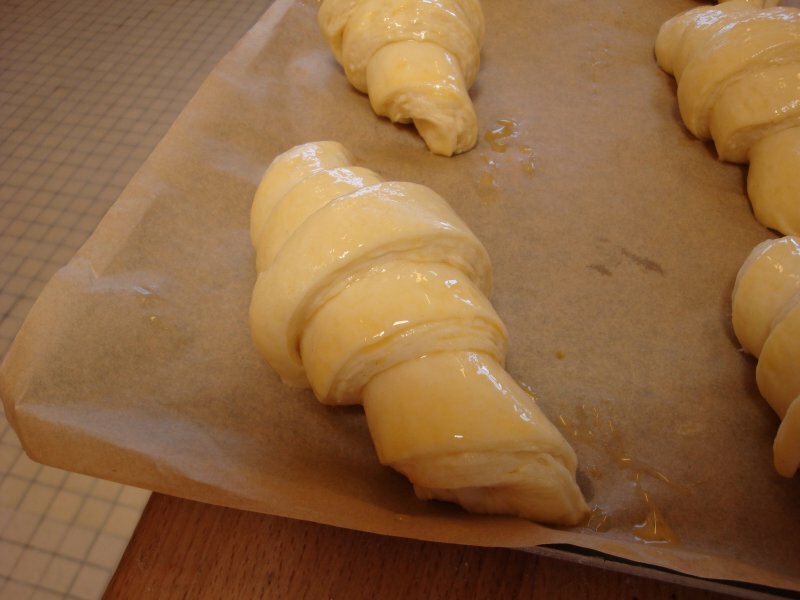 Ah, the French croissant! I love, love, love it. I love eating it, and I love making it even more. 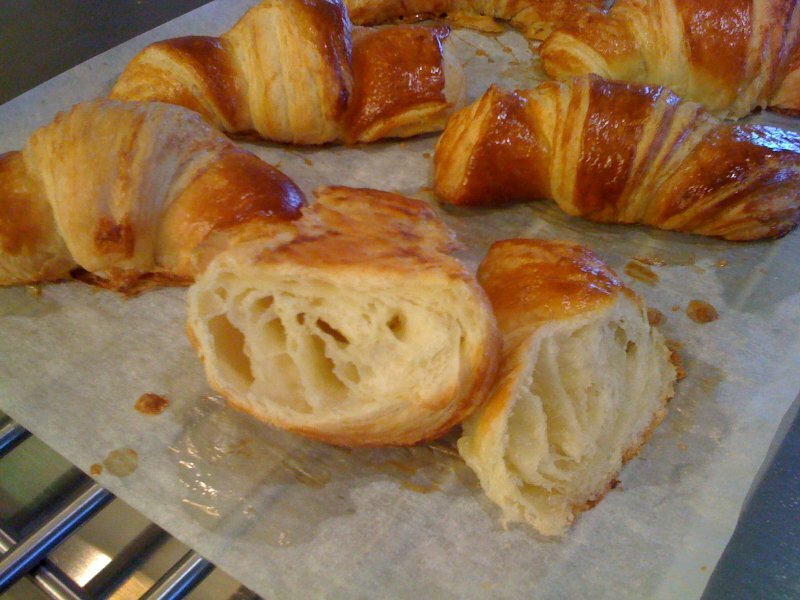 A regular croissant in Paris costs about 85 Euro cents. It feels light for its size—from 60 to 80 grams. It is flaky on the outside, soft on the inside but with a body and chew, and the layers should be clearly defined. There should be large crumbs (holes left by air bubbles) inside as well. If you pinch it, it should flake before it gives. I wanted to live in Paris for the longest time, but I didn’t know what I would do when I got there. One day I was watching the Food Network channel on TV at home in Portland, and saw Giada De Laurentiis on her program. She mentioned something about when she was attending le Cordon Bleu in Paris, she had lived on rue du Cherche-Midi… So there was a Eureka moment for me. Making the dough couldn’t have been easier, and I thought that we took less than 10 minutes throwing together some Type 55 flour, some compressed fresh yeast, some sugar, some salt, and some water. 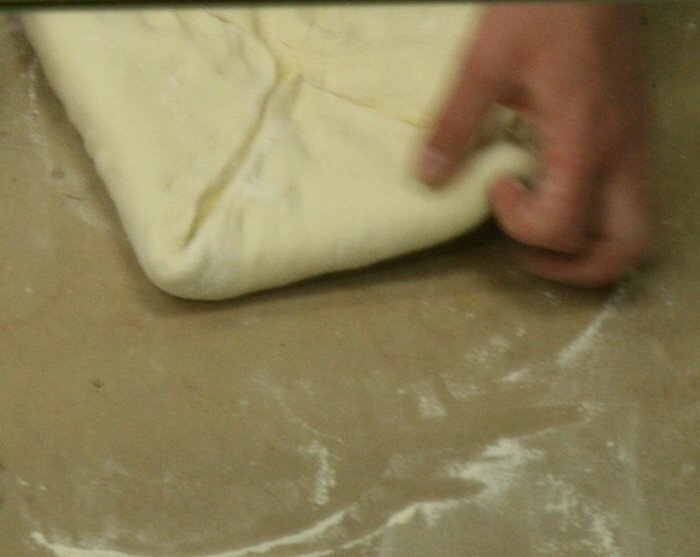 We wrapped the dough in several layers of plastic and put it in the freezer because we wouldn’t be making the croissants until several days later. When we came back to make them, again it was straight forward, and I did what le Chef did at the demo: you roll out the dough, put some beurre sec in the middle, close it up, roll it out to one length of the rolling pin plus the width of a Frenchman’s fist. You do your standard 3 simple turns, form the croissants, brush with egg wash, and into the proofing box at 30°C for 30 minutes. Brush another coat of egg wash, then au four at 180°C. 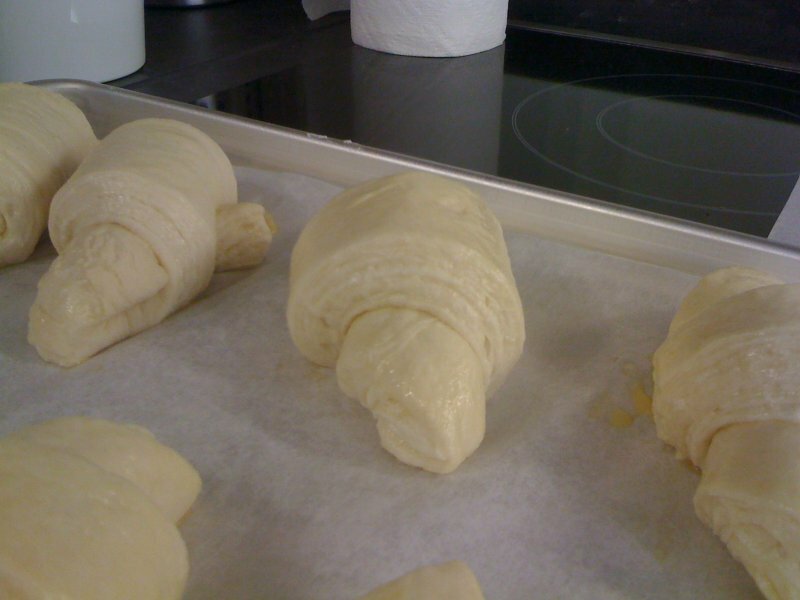 18 minutes later—my very first croissants! So you say, what’s the big deal and all that fuss?! One of these cost 20,000 Euros! 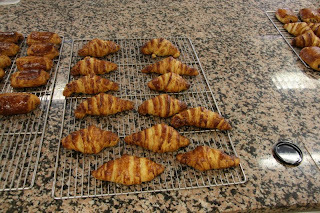 I went home after the Intermediate course 6 months later, in September 2008, and couldn’t wait to make croissants again at home in America. Then everything went wrong, or did I even get anything right at all? First of all, flour—there is no Type 55 flour in America, so what is it? All purpose flour or bread flour? Compressed fresh yeast? Forget about it! Dry butter? Good luck! I bought what I thought would be “close enough”, and it was a series of what le Chef would have declared “Olalalala! C’est catastrophe! !”: 1) the dough would stick to the table, 2) the skin of the dough would tear, 3) the butter would come through the skin, 4) the proof setting on the oven would be too hot and the butter would melt and the skin would blister, 5) during baking all the butter would leak out to the pan and the miserable looking dough would be swimming in butter. Day and night I tried, but still I couldn’t get the result I was looking for: the layers were not distinct, the inside was wet and dense, and the croissant wouldn’t puff up, and so on. So, off to school I went… Only this time I needed to go to a school in the U. S. where I could find out what the correct ingredients to get. In February 2010 I went for a course at San Francisco Baking Institute that is run by a French chef, Michel Suas. There I learned about using SAF Red yeast in the levain, osmotolerant SAF Gold yeast in the main dough, and the magic ingredient of diastatic malted milk powder to help breaking down sugar and starch in the flour to feed the yeast. More importantly, I found out about the ingredients to get—flour: King Arthur all purpose flour or Whole Foods 365 Organic all purpose flour, butter: Plugra or Cremerie Classique from Larsen’s Creamery, yeast: SAF Red and SAF Gold. Finally, probably after another €10,000. of investment in education and expenses, I was able to make a croissant similar to what I could buy at any street corner boulangerie in Paris for 85 Euro cents. Still, perfection is elusive, but my passionate pursuit of it is relentless. Epilog: I spent another US$2,000. on a manual laminoir to help with the feuilleté process, but the result is still not ideal. Perhaps one day I will buy a house with a kitchen large enough so I can put in a motorized Rondo laminoir and a vented oven with steam feature. Sigh!